Today is the day! We are officially open for business at The Clubhouse! Its been 4-5 months of educating, planning, communicating, and executing our plan to bring the best possible indoor golf experience possible. Once you are here you wont want to leave! We have successfully combined phenomenal BBQ and a top of the line indoor golf experience. If you haven’t had the BBQ Egg Rolls then you are truly missing out! The most fun I had all week was watching my own son play the mini-golf games and Skeeball. These “mini-games” are great for a 2 year old as well as any age. You don’t need to be good at golf to play these mini games. Our staff can tweak the settings easily so your whole party can have fun. If you have never played a simulator before, I would encourage you to come with a friend and reserve the simulators for no more than an hour. Our staff can show you the mini games, range, and golf course options. These simulators are great for work parties, dates, family outings, corporate outings, birthdays, diaper parties, charity events, receptions, bachelor parties… the list is endless! If you would like to stay up to date about our upcoming leagues and tournaments, sign up for our mailing list or call 309-424-6802 anytime. We are looking to offer both YEAR ROUND leagues and tournaments with awesome prizes! Are you looking to UPGRADE your clubs this year? The Clubhouse is an official Callaway Fitting Studio. Our staff can fit you to with the perfect club for your game no matter how hard you swing. All this stuff and more. Stay tuned and stay warm this Winter at The Clubhouse Indoor Golf! Find out exactly how far you hit each club before you play outside! Rain and Snow this Weekend? 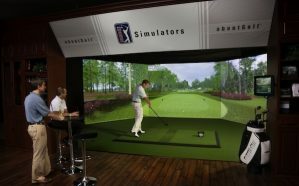 What is a golf simulator?